Alfredo Andaya and his fishing partner Vince Urayanza were getting ready to pack up and leave their fishing spot in Keanae, Maui when they hooked up Alfredo's 124-lb ulua. 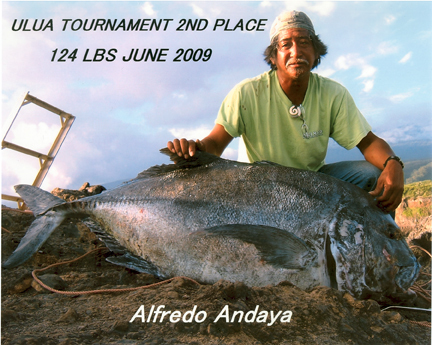 Alfredo wrote: "All I was hoping to catch someday was my 100-lb ulua. Better yet, hope and joy blessed me with an extra 24 lbs more. I thank Jesus for helping hands to pull it up up the cliff and for bringing the step ladder to bring the fish on land. To my son-in-law Jay Urayanza, brother Vince (awesome) and Marshall: mahalo nui loa ke akua iesu."